Belly button piercings are popular among many people. 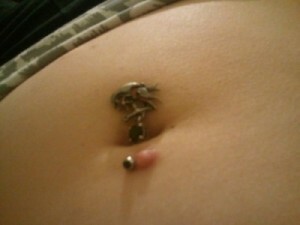 When you have your navel pierced, you should remember that it will take some healing before it will look normal again. It is fairly common to develop an infected belly button piercing, so be aware that it can happen. You may not even be able to tell, just from looking at it, whether it is infected. This article details the ways to identify infection, as well as how you can avoid infection, and how to treat it if you do get one. The navel is a damp, dark place, and infections can occur, especially if you have a deep navel. You will sweat, and dead skin builds up in the belly button at times, too. Belly button piercings are becoming more numerous, accounting for about 1/3 of US piercings, and about 31% of people who have their navel pierced will develop some complication. 15% needed medical attention, and 0.9% even had to be hospitalized to be treated, according to howshealth.com. As far as risk is concerned, a navel piercing is the second highest likely to become infected, after only the eye. The piercing hole gives infections a way to get into your body and to reach your abdominal cavity. Steadyhealth.com reports that it’s risky to get navel piercings, since the needles used may spread infection, and because your jewelry will often touch your clothing. 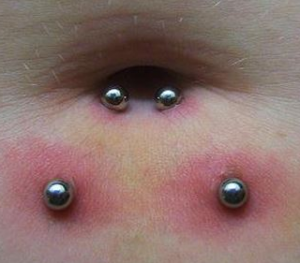 In addition to infection, navel piercings have an inherent risk for stretching with pregnancy or weight gain, piercing rejection, keloid formation and piercing scars. 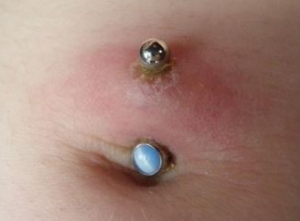 Are you faced with an infected belly button piercing? These are the main signs of an infected navel piercing, but they’re not the only ones. As soon as you notice something abnormal, or something causing greater than typical discomfort in the area, consult your physician to find the reason behind that discomfort. Remember that some redness, mild bleeding, aching, tenderness and swelling are normal for a new piercing. However, after the first several days, these should show signs of improvement. What could cause your infected belly button piercing? To help you in identifying symptoms and signs of infection, we’re including some photos of infected piercings. They will help you in determining if you have an infection. Can you get an infected belly button piercing while you’re pregnant? If you’re pregnant, and get a navel piercing, you can wear your jewelry until month five or six. After that time, jewelry should be removed. Can a scar from navel piercing affect you during pregnancy? After you have given birth, don’t start wearing your jewelry right away. Allow a few months before you start wearing it again. You can develop an infection in your navel piercing while you’re pregnant, too. Be sure to get treatment as soon as possible. There are some medications you won’t be able to take while you’re pregnant. Speak with your physician before taking any medications, so you’ll avoid any dangerous side effects. Cleanse the area with alcohol. If you only have a mild infection, cleansing with alcohol can be used for disinfection of the microorganisms that might be causing your infection. It halts bacteria growth. Do not choose this option if you’re allergic to alcohol. DO NOT remove your piercing jewelry. Unless you are pregnant, don’t take out your jewelry. Some physicians may advise it, but experienced professional piercers usually don’t. If you remove your jewelry, the hole may close up and develop into an abscess. This means the infection is left inside, which can cause more complications. Mix 1/2 teaspoon of sea salts into a cup of warm (not hot) water to create a saline solution. This can be used in cleaning the infected area. It also keeps mild infections from progressing. Use a clean cloth and apply a warm compress to the area that is infected. Do it a few times a day, for five minutes each time. This allows for proper drainage. It hastens the healing process of an infected belly button piercing and increases blood flow to your navel. Aloe Vera has anti-inflammatory properties, so it helps with infected navel piercings. If you have fresh aloe Vera plants, use the gel from a leaf, applying it to the area that is infected. Otherwise, use aloe Vera gel or lotion from a bottle. This can be applied a few times a day to help in easing swelling. White vinegar has an acidic content, so it fights infection and prevents it from spreading. Mix some white vinegar in warm water and apply to the area that is infected with a cotton swab. Rinse it thoroughly when you are done. Emu oil, lavender oil or tea tree oil can help with infections in the navel, since they possess natural properties of healing. Other natural healing agents include zinc, vitamin C and vitamin D. Any of these can help in speeding up the process of healing. Turmeric has antiseptic properties naturally, so it helps in treating an infection and in preventing the development of additional infection. Mix turmeric powder and water, then apply to the area affected. After the paste has dried, wash the infected area and dry softly with a tissue or towel. Use this method a few times a day. You may also prepare a turmeric drink. Mix hot milk and honey with 1 teaspoon of turmeric powder and drink it. This will stimulate faster healing. If your infected belly button piercing is swollen and bruised, you can apply an ice pack wrapped inside a towel. Don’t apply ice directly to your skin, since it can cause tissue damage. Cold packs aid in reducing swelling and bruising. If you have developed an abscess and it isn’t efficiently draining, a physician can administer surgical drainage. This is used only in more severe cases. If there is pus being excreted from your piercing site, your physician probably will prescribe an oral antibiotic. This helps in eradicating the infection-causing microorganisms. You may also be prescribed topical antibiotic creams for milder infections. If your piercing causes a great deal of pain, you may use medications you can purchase without a prescription (OTC) to ease it. Try acetaminophen for pain, or the NSAIDS ibuprofen or Naproxen for pain and inflammation. After you have treated the area of infection, you may develop a rash, from the cleansers you’re using or the piercing itself. Avoid these allergens. Choose products that do not cause any rash. 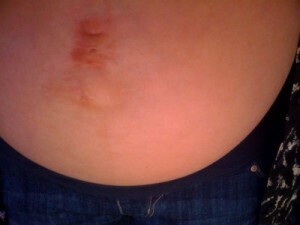 OTC ointments have antibiotic properties, but they shouldn’t be used on an infected belly button piercing. 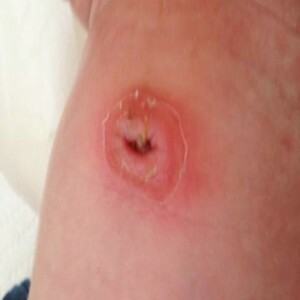 Ointments cause trapping of bacteria, which exacerbates the problem and leads to a longer healing time. If you have symptoms beyond the first several days after a piercing, or they are worsening instead of getting better, call your physician, so that the cause can be determined and a treatment plan can be started. The video below shows common methods of dealing with an infected navel piercing. How can you prevent an infected belly button piercing? Avoid touching or irritating the piercing site. Wear clothing that fits loosely, as your piercing heals. Keep your piercing site dry and clean. Take showers, not baths, since bathwater can transfer bacteria. Check the site daily for any symptoms or signs of infection. The average time for full healing of a navel piercing may be months or even years. During the first several weeks especially, proper aftercare is a must, to avoid infection. Follow the aftercare instructions carefully, to avoid the risk of infection or other problems. Previous articleIs Food Poisoning Contagious?